There are three basic groups of functional factors in every human being, as Ayurveda says. These Doshas, known as Vata, Pitta and Kapha, does the proper balancing of our body. They act as the forces helping the body for carrying out metabolism, growth, digestion and all functions in the cells, tissues, organs and the body whole! While Vata involves the internal movement, Pitta takes care of the metabolism including digestion, and Kapha maintains the structuring and lube of the body. According to the subtle dominance of these doshas, Ayurveda understands the individual difference of human beings as Ayurvedic body type. – Vata is a combination of ether and air. In balanced form, it helps to keep a balanced and flexible body and mind. The functions like breathing, locomotion, blinking, internal movements in cells, heartbeat, etc will be normal with a balanced Vata. Once out of balance, Vata initiates fearfulness, agitation, depletion, degeneration and stress. – Pitta is a combination of water and fire. It is often connected to the metabolic and digestive systems and the body temperature. Functions such as assimilation, nutrition, digestion, absorption, metabolism, hormones, vision and cognition are associated with Pitta. A balanced Pitta adds to intelligence, perception, light body, clear mind and leadership. Imbalance of this Dosha ends in bitterness, jealousy, inflammation, autoimmune disorders and hate. – Kapha is a combination of earth and water. It helps to build the bodily tissues and save energy needed for the body. A balanced Kapha helps the bones, tendons, and muscles and holds the cells together. It provides lubrication to all the body parts, protects joints, sustains immunity and moisturises the skin. A balanced Kapha also brings love, calmness, compassion and mercy. Imbalanced Kapha makes you attached, congested, heavy, depressed, blocked and greedy. 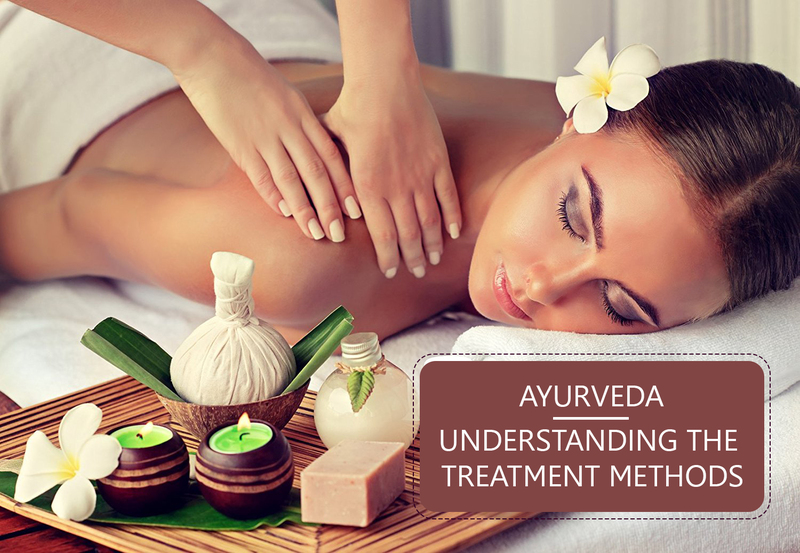 Ayurveda aims at keeping Doshas in balance. As the imbalanced doshas are the triggers of all physical & mental ailments, all health issues can be eliminated once the Doshas are under control. Vaidya- the Ayurvedic physician- thoroughly assesses the symptoms of the disease which causes the Dosha imbalance. After assessing the patient and determining the fitness for various methods of treatments, the treatment will begin. A direct questioning, proper observation, and a thorough examination are involved in understanding the ailment. The physician will also inquire about diet and the lifestyle of the patient. Examining the tongue, physical features, eyes, and pulse forms the primary examination in an Ayurvedic consultation. Further, the body mass, condition, teeth and skin are also examined for analysis of the ailment. Finally, joints, abdomen, different systems will also be examined as needed. Once the diagnosis is completed, the treatment begins. The treatment comprises of various Ayurvedic massage therapies, detoxification, diet and lifestyle modification and/ or herbal medication as needed. Dr Rafeena offers you a wide range of Ayurvedic Treatments which rejuvenates your body and mind. Dr Rafeena is born, brought up and learned Ayurveda in Kerala (She also practised Ayurveda in Kerala around 7 years before coming to Australia). Kerala is considered as the cradle of genuine Ayurveda, the place which literally never lost the continuity of growth of Ayurveda. Devoid of stress and anxiety, the fresh and detoxified body brings you well-being and serenity. You can always come to your specialist Ayurvedic doctor to know more and discuss your health and ailments. Contact and book your appointments at Dr Rafeena now.